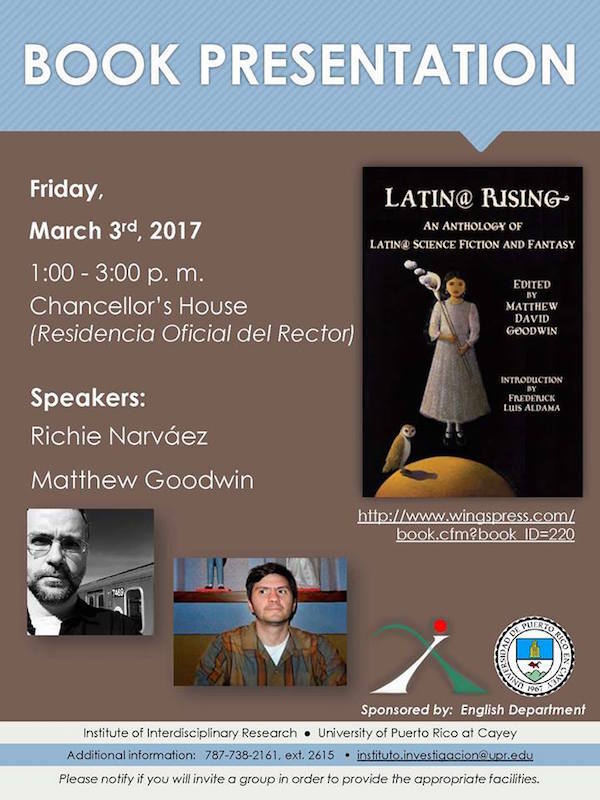 Early next month you can find me doing a flyby visit to Puerto Rico, courtesy of Matthew David Goodwin, editor of Latin@ Rising: An Anthology of Science Fiction and Fantasy, and the University of Puerto Rico at Cayey. Airport security, planes, student strikes, and impending apocalypse permitting, on Friday, March 3, I’ll be running a Fiction Writing Workshop at Sala Héctor Campos, UPR, in Cayey, from 9 to noon. If you’re in PR and want to go, you can register here. From 1 to 3 p.m. that same day, I will be part of a book presentation of Latin@ Rising with Matthew at the Chancellor’s House. On Saturday, March 4, from 6 to 7 p.m., I will be part of a panel on “La Ciencia Ficción en un Tiempo de Crisis,” also with Matthew and with Miguel Adrover, at Libreria La Tertulia, 251 Calle de La Cruz, in Viejo San Juan. Apologies to all my relatives on the island! There won’t be time for visiting, but come see me if you can!